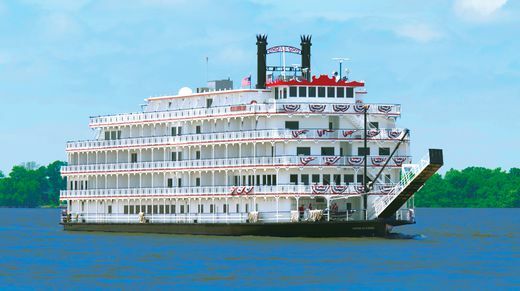 The Queen of the Mississippi (formally the American Eagle) made its debut on the Mississippi River in summer 2015. 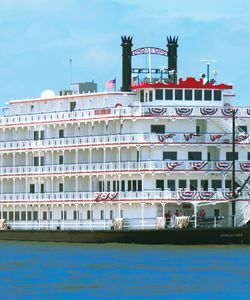 The 150-guest paddle wheeler features Victorian-influenced design elements reminiscent of an earlier time on the river, including gingerbread architectural details, balconies, and a red paddlewheel. Spacious staterooms feature private balconies, sitting area, king/twin bed configuration, air conditioning, open closet, writing desk, HD flatscreen TV with DVD player, and en suite bathroom with shower. Outdoor public areas feature two open-air lounges with comfortable wicker furniture; open viewing terraces on the bow of the ship; and outdoor fitness area and putting green. Interior spaces include the Magnolia Lounge, which can seat all guests; the large Victorian-style Skye lounge with wicker furniture; the smaller, club-like Paddlewheel Lounge overlooking the paddlewheel; and a chart room and library. The spacious and bright dining room seats all guests at a single seating with regional menus that utilize locally sourced items and often reflect a Creole and Cajun influence. 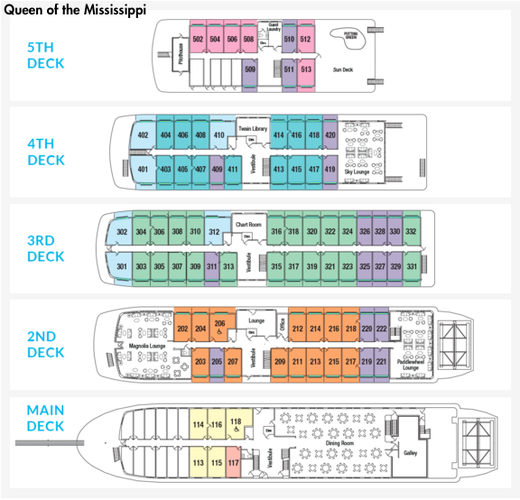 Complimentary WiFi is offered throughout the ship, including each stateroom, and an elevator services all decks.